Steve's LEDs includes a FREE power cable and FREE power adapter with the purchase of every Bluefish Mini Gen2 while supplies last. Designed specifically for immensely popular Mean Well LDD-H and Steve's LEDs drivers, the Bluefish Mini is a case-less module that brings many of the lighting features of Bluefish for about half the price. 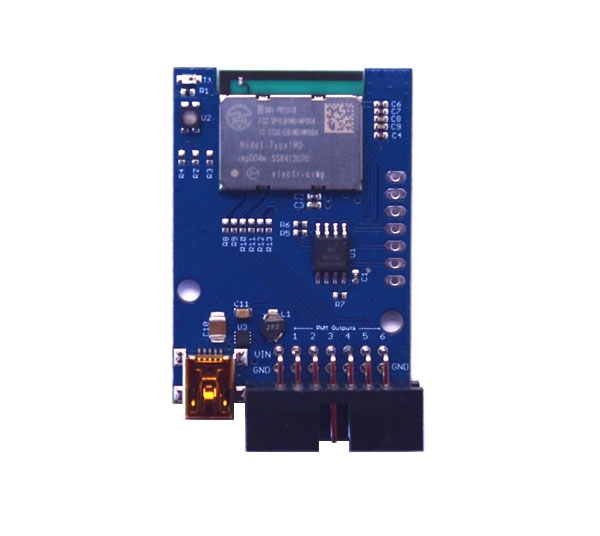 This model targets users building DIY fixtures, and manufacturers wishing to incorporate Bluefish directly into their fixtures or driver boxes. 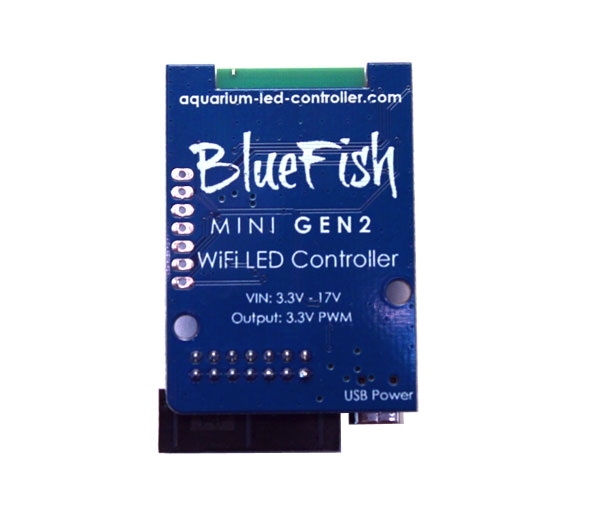 The Bluefish Mini Gen2 uses the same app and Wi-Fi connectivity of it’s bigger brother, but lacks analog output and BluePort expansion capabilities. The Bluefish Mini is only compatible with Mean Well LDD-H drivers and Steve's LEDs brand drivers. Built-in Wi-Fi connection means you are up and running in a snap. No messing with long runs of ethernet cable or finicky Wi-Fi gateways. The cloud connection means your device is instantly accessible from anywhere, with no router configuration necessary. Bluefish simulates unique cloud cover patterns using the current weather conditions from your simulated location. 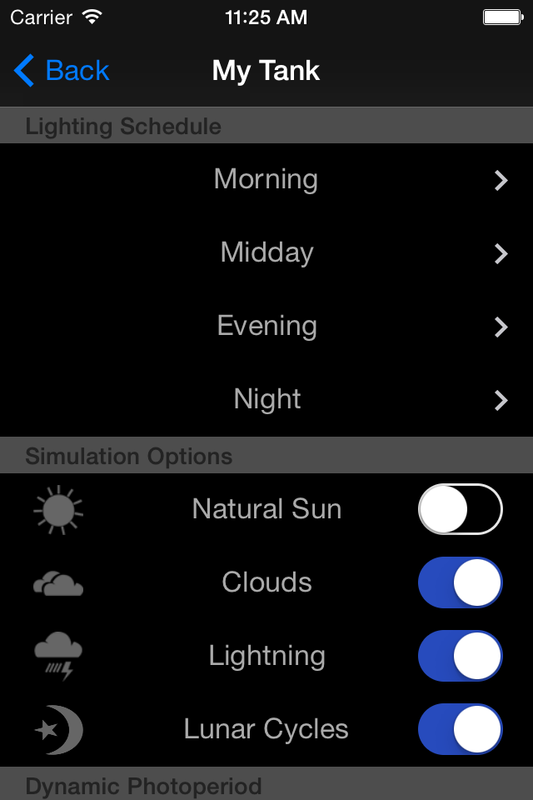 Unique weather conditions include clear, partly cloudy, mostly cloudy, scattered clouds, rain, haze, overcast, and thunderstorm. Integrate the video feed from webcams directly into the app! 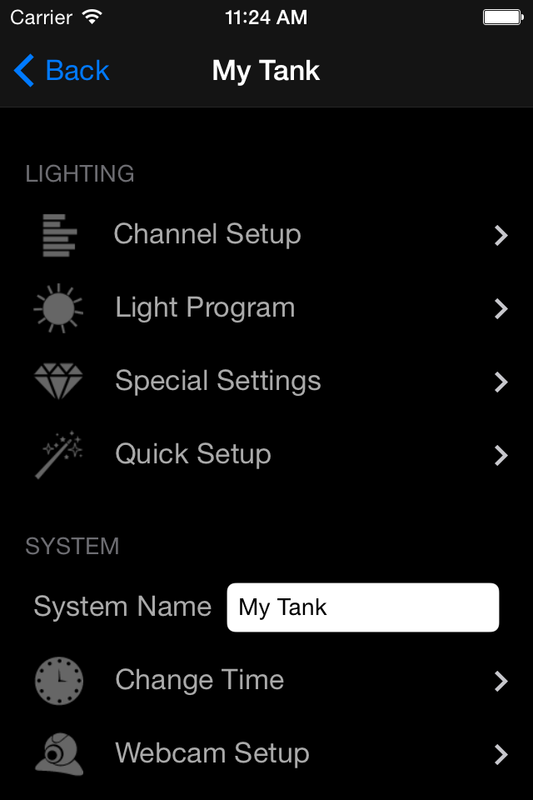 Check up on your tank, make changes remotely, or just have fun showing off….start a thunderstorm and watch the action from anywhere! 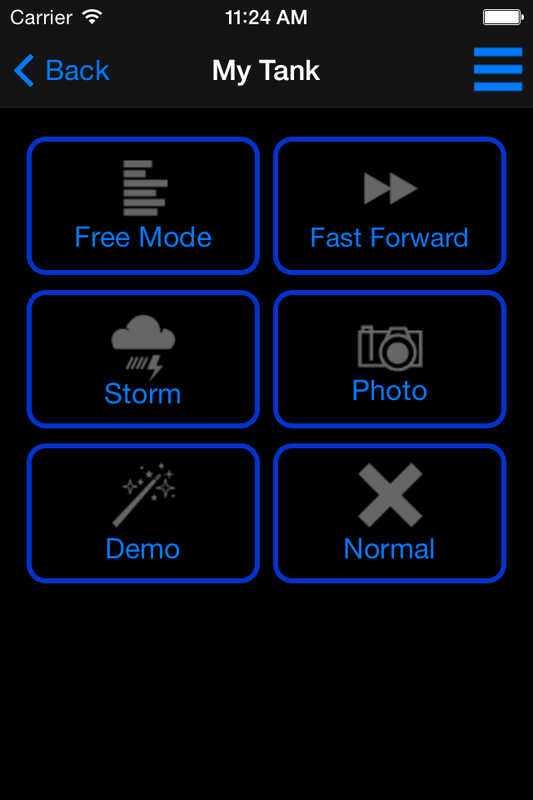 Start a thunderstorm from the app and lighting strikes are synchronized with audio from a real thunderstorm. Connect your phone or tablet wireless to a Bluetooth speaker for maximum effect! Wi-Fi configuration is extremely quick and easy. 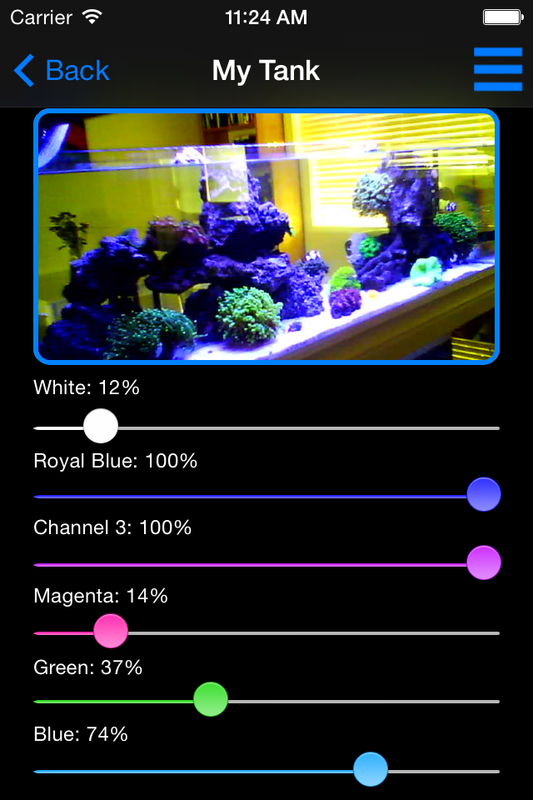 Select your network, enter the password, then hold the screen of your mobile device to the sensor on top of the Bluefish device. 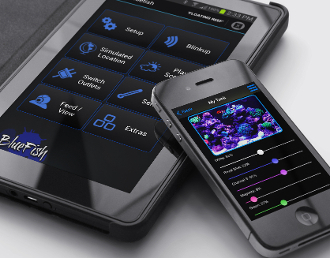 Your mobile device sends the configuration by flashing the screen (think Morse code). In about 10 seconds, your Bluefish controller is online and accessible from anywhere. Absolutely no router configuration necessary! Programming your light schedule and customizing your channels is a snap. Bluefish was created with your security in mind. End-to-end SSL encryption protects your data from prying eyes, and your settings are stored securely in the cloud. 4096 steps (12-bit PWM) of individual LED brightness control. Q. Is it necessary to have my Apple/Android device connected at all times in order for the controller to run properly? A. No, the app is required to change settings only. It is not necessary to be connected through the app for the controller to function. Q. Can I use the app on multiple devices? A. Yes. Your Bluefish controller settings are associated with your user account. You can log in from any Android/Apple device with your username and password. Cable Options - We have various cables ready to go to save you the trouble of sourcing them yourself. Bluefish Mini does not come with any cables stock, this is because there is no cable that magically fits all customer uses. We have 3 options, that meet the majority of uses. If you need a cable that you don't see here, just Contact Us and we are glad to make it for you with a lead time of only about 1 day. 1) 6X pairs 6" Pigtails. This allows for 6 independent channels of control, with bare wire ends. This means you'll need to solder them to wire extensions that go to your LED drivers, or you can use quick splicers to connect them in about 2 seconds, with no soldering. 2) This is a connector, specifically for an LED system that has a cable in place which formerly used the HurricaneX V5.0RSM that ships with all of our LED systems. This connector has 2X separate 4P connectors. 3) This is a connector, specifically for an LED system that has a cable in place which formerly used the HurricaneX V5.0S. This connector has 1X 16P connector with wires on the right half. This is the version that usually ships if you purchase the HurricaneX by itself. If in doubt which version you have, send a photo to Techsupport@StevesLEDs.com and we'll be glad to verify for you.